Western Watersheds Project’s California Office is working on public land issues throughout the Golden State from the southern deserts, through the Sierra Nevada, to the high country of the northeast border with Nevada. grazing on the Yankee Jim Area of Critical Environmental Concern first through an attempted “Categorical Exclusion” and then with no NEPA review at all! On July 23, 2008 Judge Sweitzer ruled that the latest grazing decision issued by the BLM Alturas Field Office be set aside for failing to complying with the National Environmental Policy Act (NEPA). 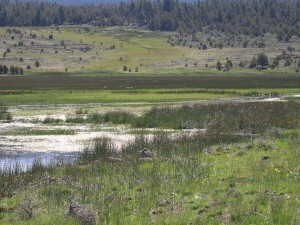 The Yankee Jim Ranch is a small allotment consisting of only 1,500 acres but the entire site was designated as an Area of Critical Environmental Concern (ACEC) in April 2008, a fact that BLM had ignored when it issued its decision in May. The Yankee Jim ACEC was designated due to the presence of numerous important archeological sites, including over 90 prehistoric sites in the meadow and upland areas, and important historical connections. According to the BLM’s own reports, cattle have been trampling, trailing and dispersing artifacts, pawing and digging, and even wallowing on the archeological sites and these disturbances have escalated in recent years. Despite this, the BLM had proposed to permit livestock grazing on the allotment without even the most basic environmental analysis. We are continuing to monitor BLM efforts to continue or expand livestock grazing on millions of acres of public lands in the California Desert District where imperiled species are impacted including the desert tortoise, state-protected black toad, and listed populations of bighorn sheep. We also participate in collective efforts to transform BLM’s livestock grazing management on California’s “Serengeti” – the Carrizo Plain National Monument. We are keeping a watchful eye on the Forest Service which has been using categorical exclusions in lieu of conducting full environmental analyzes for allotments in a number of different National Forests covering over 500,000 acres. This includes allotments in the Sequoia National Forest Service, Inyo, Lassen, San Bernardino National Forest, Stanislaus National Forest and Giant Sequoia National monument.